ISLAMABAD, Pakistan -- A longtime ally of the man tipped to be India's next leader has been caught on camera making anti-Islamic comments, raising questions about how an incoming government led by Narendra Modi would treat its 176 million Muslims. "We should have it in us to take the law in our own hands in an area where we are a majority and scare [Muslims]," says Pravin Togadia, the leader of the Vishwa Hindu Parishad (VHP), which is itself a part of an umbrella of Hindu nationalist organizations that includes Modi's Bharatiya Janata Party (BJP). 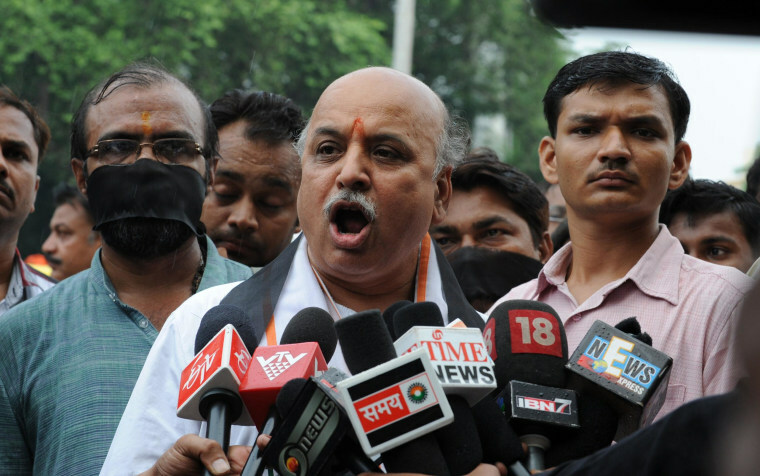 Togadia goes on to describe violent ways to evict the Muslim tenant of a building, according to various translations of the video that emerged earlier this week. Though officially secular, the world’s largest democracy is poised to elect the Hindu nationalist BJP in its ongoing elections. With some 815 million people thought to be casting their votes, the vote is phased over several weeks and will end on May 12. Results are due to be announced on May 16. The ruling Congress Party and other political parties quickly condemned the Togadia incident, which was compounded by a controversy by another leader linked to the BJP. In the northeastern state of Bihar, BJP candidate Giriraj Singh said that those who did not support Modi could “go back to Pakistan,” India’s arch-rival and a predominantly Islamic republic. Modi, who has been linked with Togadia since the 1980s, condemned both remarks via Twitter. I disapprove any such irresponsible statement & appeal to those making them to kindly refrain from doing so. While Modi has distanced himself from hard-line anti-Muslim comments, many hold him responsible for 2002 Hindu-Muslim clashes in his home state of Gujurat that left more than 1,000 dead -- most of them Muslim -- and hundreds more injured. Violence between Muslims, Hindus, Christians and Sikhs has dogged India since it became independent from Britain in 1947.